Barring a breakthrough in the stalled negotiations between English Premier League club Arsenal and defender Bacary Sagna, the 31-year-old will be one of international soccer’s top free agents in the offseason. But Sagna’s summer plans include more than scoring a new deal with a new team, as he will also be trying to help France win the 2014 FIFA World Cup. In preparation, he’s turned his car into the fastest World Cup poster on four wheels. 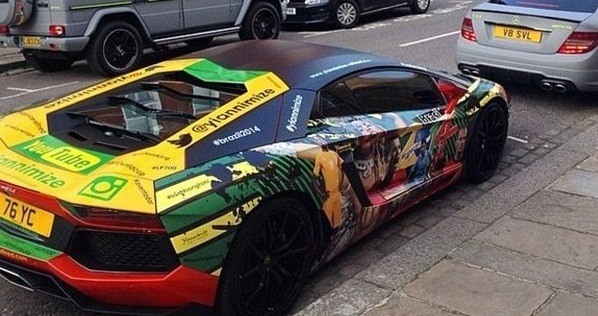 Sagna, a Senegalese Muslim raised in France, recently sprung for a paint job that is a work of art; his $500,000 Lamborghini Aventador has been customized with a World Cup theme, as seen in the photo above. World-famous soccer stars Lionel Messi and Cristiano Ronaldo are two of the real-life players featured on the car, along with Sagna’s Arsenal teammate and fellow Muslim player Mesut Ozil.